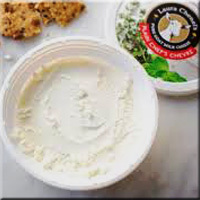 A favorite among chefs for 20 years, Laura Chenel’s Chef's Chevre is soft and creamy with subtle tangy flavor. Available by the 4# container. Often used in place of Creme Fraiche, Chef's Chevre is perfect for spreadable applications like sandwiches and wraps, melts perfectly into sauces, mixes with herbs for fillings, and makes a fluffy, luscious goat cheesecake.